The ancient city was known for the manufacture of the red powder, olive oil, wine and of the importance of its location. Part of the ancient village, the Acropolis and two temples of Apollo is sunk in the harbor of Porto Heli, who was then dried. In Kranidi there is the Folklore Museum. In Koilada there is one of the most important caves of Europe, the cave Frachthi. According to surveys, it is likely to be inhabited by the Neanderthal man, and the Homo Sapiens. The oldest complete skeleton (male) was found in Greece dated 10000-8000 years. Also , there were found female figurines, beads, jewelry and polished shells, which are kept in the Archaeological Museum of Nafplio. It is worth visiting the Monastery of Avgo. This monastery is built on a rock. The main building of the monastery consists of ground floor, two floors and roof cells. In the southern part of the monastery is the church of St. Demetrius Myrovlyti. Very known also is the Katafyki Gorge. The Gorge was mentioned in the Greek mythology as the entrance to Hades and the point where Hercules pulled out Cerberus. 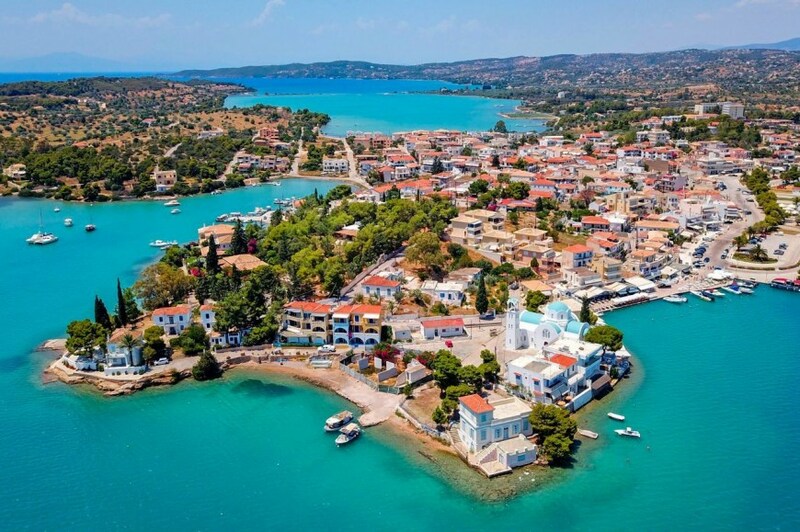 The Porto Panorama and Porto View hotels are ideal bases to visit nearby destinations of exceptional interest and of great beauty such as Hydra, Spetses, Ancient Epidaurus and Nafplion.